As one of most influential people in the music industry, Violet Brown is responsible for helping some of the biggest names in music including Tech N9ne. Now as Vice President of Label Development for Strange Music, the icon is using her industry knowledge to help the indie juggernaut during one of its biggest years. Violet Brown recently joined us on the Strange Music Podcast to discuss her illustrious career and the path that led to Strange Music. Among the topics at hand were Stevie Stone and his Strange Music debut, Rollin’ Stone. In this brief interview segment, Violet Brown shares her excitement over Stevie Stone and his latest release. Have you heard his album Rollin’ Stone? Oh yes. I sat in a truck recently with Dave Weiner in Kansas City and we listened to this in the car system. We wanted to hear it like a person would hear it driving down the street. That’s the way I’ve always preferred to listen to my music. When I was a buyer, they would bring the music into me and I would listen in my office. If that music made it out of my office and into my car, it was pretty much set that it was going to be a big deal for me and I was really going to take care of it in my stores. 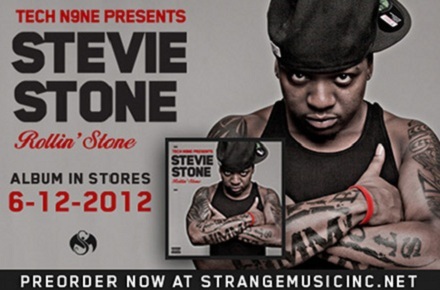 Stevie Stone is the kind of record where I want to listen to Stevie in my car. I want to roll with this record because it is so so good. Song after song is extremely strong. A favorite standout for me is a song called “Oneness” and that features Morgan’s Heritage, which to me, are just legendary reggae stars. I love that group, Morgan’s Heritage, and they’re on the record. I don’t think they’ve ever been on a record like this before. It really is amazing. On the album, Tech, Krizz, and Mayday are all on the album. It’s just song after song – great. We’re dropping it on June 12 and right now Stevie is killing it nightly on the Hostile Takeover 2012 Tour. Don’t get there late because some nights they switch it around, the line up, you don’t want to miss anybody on this tour and you certainly don’t want to miss our next guy which is Stevie Stone. He’s coming out of St. Louis and this guy is going to make a name for himself. He’s going to be around a long time. I’m real excited about Stevie. Once again Dave Weiner was very instrumental in bringing Stevie Stone over here, and has been very instrumental in the whole process of Stevie making the album. “808 Bendin” to me is one of the best music videos that we’ve put out. I mean, it’s an amazing video for an amazing song. I was there when they shot the video and I watched the whole process. It was awesome to see that go down. He’s definitely one of my favorites. I heard he also sings on this record. That’s something I did not expect. Yeah. We’ve been mentioning through the Hopsin through the conversation and you’re gonna hear Hopsin on the record, on a song called “Raw Talk”. I think you’re going to be quite pleased. If you listen to Stevie live, you’re going to see how he really fits within the Strange Music family when you see him on tour. What do you think about Violet’s comments on Stevie Stone? Are you excited for Rollin’ Stone?